American firms boosted investment banking revenue by 3 pct last year; the top line at their European rivals is set to shrink. That will strengthen Wall Street’s hand when competing for staff. Meanwhile, equity traders and M&A advisers should do better than fixed-income peers. 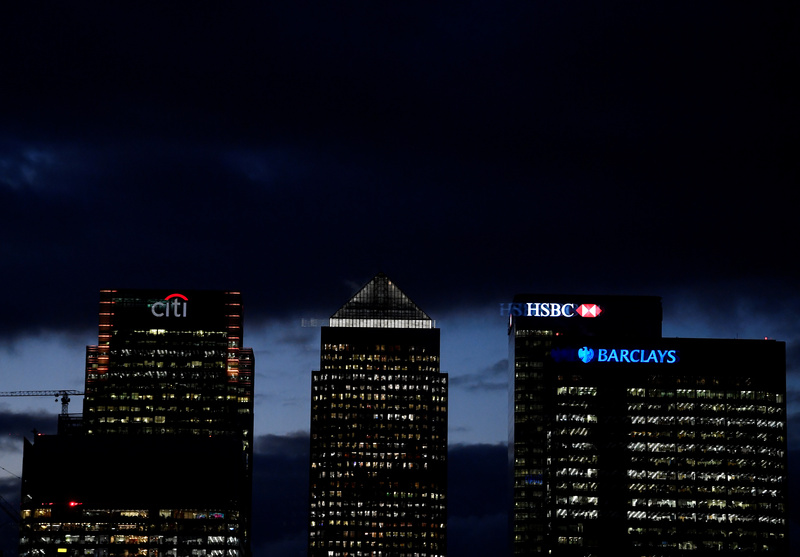 Citibank, HSBC and Barclay's buildings are lit up at dusk in the Canary Wharf financial district of London, Britain, November 19, 2018. JPMorgan is boosting its bonus pool by 3 percent for 2018 after its investment banking division topped industry charts throughout the year, according to a Reuters report on Jan. 10 citing people familiar with the matter. Those in the equity trading division are expected to do especially well after JPMorgan’s equity markets revenue was up 17 percent in the third quarter of 2018 over the prior year. By contrast, Deutsche Bank’s management board has decided to cut the lender’s 2018 bonus pool by around 10 percent in an effort to cut costs, Bloomberg reported on Jan. 8. Bloomberg, citing unnamed people familiar with the matter, also reported that bonuses would be paid more selectively in an effort to retain talent. The bonus pool could change, depending on fourth-quarter earnings figures, the report said.